Twenty years and several owners later, my trusty 1989 Buick Park Avenue hit 250,000km today. I have to say that as much as I originally thought this car was kind of lame, I've come to love it. It's become a character, not just in some of my movies, but to anyone who knows me. Lovingly referred to as THE Buick, she's been around since I was a kid when she was my moms. 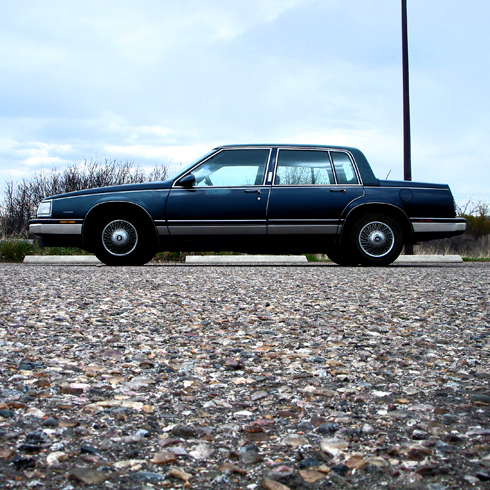 When I think about the family vacations we went on, driving her when I was 16 and throughout high school, trips to university, and then finally owning the car when I turned 21, the Buick has been a significant fixture in a lot of the things I've done. Here's hoping she still has a few more adventures left in her. Thats not that much km for that car. My '02 Focus has 210 on it and 100 of those are from me in the last 3 years. There goes the environment. well no doubt you can rack up a lot of km on road trips, but consider that for the most part these km were put on in the city. that's what kills a car faster in a lot ways, but what makes it seem better to me is that despite the km the car is still in pretty nice shape. which if we go by your description of vehicles, haha, can be difficult to maintain over 20 years.